Hey there. I bet you weren’t expecting a blog from me today. Neither was I, it has been a while. I’m going to admit, I’m probably only blogging because I’ve sat down to write, so many may call it procrastination. I actually wouldn’t argue with them. Still, I’m writing a blog, and you know what they say, it’s the first step that’s the hardest, so after this they should come flowing to me and I’ll be blogging all the time! To break me in gently to this whole blogging thing, I thought instead of a conventional blog about writing (as the title of the blog goes), or a book review (as I’m getting better at doing, but still WAY behind where I should be this year), I’d do a blog on things I’m loving at the moment. Bit random, but isn’t variety the spice of life (I’m trying for as many cliches as possible today!). Left Overs by Stella Newman. I read it as a ‘favour’ to Laura from Novelkicks as she has so much to read, and she wanted a review on the site for when the novel is released at the beginning of May. It’s a tough job, but someone had to do it. 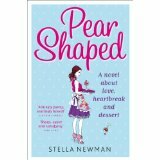 I LOVED Newman’s first novel Pear Shaped, and this ticked all the boxes I was looking for in a follow up novel. Yay. 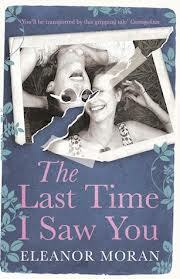 The Last Time I Saw You by Eleanor Moran. It was my turn to choose the book club book this month (well, send out a list of 3-4 books that the group as a whole chooses). This was top of my list, and luckily the group choose it too, woop! I started it last night and am already gripped, and have so many questions. I’m currently FORCING myself NOT to read it. Must get on with other things. Oh. My. God. A website dedicated to gifts for readers and writers. Top of my Want, want, want list are a ‘Go Away I’m Writing’ cotton tote bag, and the tons and tons of post it notes, and the Utility Task Clips. Oh, oh, and the Smart Women Read Between The Lines Book Lover’s Journal. I’m glad it’s my birthday soon! I may cry if I don’t get something from on here. Also, I now need an office at home to house all the things I want to buy! Eat 50 calories a day, twice a week, eat what you want the rest of the week. I did this in January and lost about 5lb, then put them back on when I went on the pig out that was the course I did in Feb (cakes and biscuits at EVERY break, almost 2 main meals a day!) when I stopped doing it. I’ve been back on it 2 weeks and have lost 3lb. Very happy with that. Today is a ‘fast day’, and I’ve only eaten 450 cals, so have another 50 (weight watchers yogurt) to eat when boyfriend has his tea. I bought my Mum Kate Atkinson’s book about the diet, so hopefully it will convince her to do it too, I hope so, will be fun to do it with someone I know (and can swap food ideas with). Today, I’m not loving: That I have nothing else I love. Now I need to get on with this writing, reviewing and editing. Sigh. I can’t remember the last time I wrote a blog, and I’m too ashamed to look. I know I’ve done a few book reviews in the last few weeks, but nothing really writing about me. I’ve been busy though, so busy. I’m in the middle of a course called NEBOSH, if you’ve not heard of it, it’s a workplace health and safety course. It’s thrilling. And long. We did a whole 9-5 week there a couple of weeks ago, then a week back in the office, and now we’re back for another week. I am shattered. Today was our last learning, tomorrow is a revision day, then next Friday we have 2, 2 hour exams. And then there’s a practical report section too. If this wasn’t enough, I started working for another company last Monday. I’m still managing the same buildings, but now have a different company I’m reporting to. Not what I need in the week between NEBOSH weeks. On top of this, I applied for a job with my old company, which I really wanted, and didn’t get it. All in all, I’m pretty exhausted. Mentally and physically (because I’ve been to the gym tonight). I’ve got a glass of wine in front of me, and totally see myself going to bed in an hour or so (is 9.30pm too early to go to bed? I probably won’t sleep will I?). So, because of all this, I haven’t done any writing or editing. It’s fine though, because I decided before it all started that I was going to give myself these 4 weeks off. As soon as we get to 23rd, I’m back on it. Well, probably 24th, I’m totally going to go out and celebrate it’s all over on 22nd, so probably won’t do anything on 23rd! You know what I’ve done though? I’ve only gone and forgotten about Belinda Jones’ Sunlounger Short Story Competition. Closing date is 31st March. Eek. I need to think about that. I haven’t even got an idea yet, or characters. AGH! Also, I found another competition I want to enter. National Express (yes, coaches) have a short story competition, with the subject travel. It closes 28th April. The winner gets their story published in Jenny Colgan’s new book The Good, The Bad and The Dumped in August. Exciting. When I’ve posted this blog, I’m going to have a QUICK play on Twitter and Facebook, print off some stuff for tomorrow, and then think more about these stories. I’ve got a couple of plans for April. I can’t decide which to do, or if I should do both. I’d really like to take part in the A-Z Blogging Challenge. Post a blog a day for 26 out of the 30 days in April, with each day’s blog being based on a letter of the alphabet. That would get me back into blogging for sure. So far 1058 people have signed up, I really wouldn’t be alone on this one. Also, if I do it, I’d want to add a category, but would I chose Writing or Books. Of course it would be writing, but I like the idea of writing about books too. You can’t have two categories. Damn. My other idea is Camp NaNoWriMo. They’ve changed the rules this year, only for camp, it doesn’t have to be 50,000 words. That would suit me, because if I did it, I wouldn’t want to write 50,000 words. I wouldn’t want to write any actually. I’d want to edit. I was originally thinking of editing for 50 hours. But now the blogging challenge is a maybe, I might go for 25 hours. Or maybe 12.5 hours. Half an hour a day. 12.5 isn’t much though. I’ll have to think about it. Maybe once I’ve done the Sunlounger story! Ooh, my second review of You Had Me At Hello by Mhairi McFarlane (first being the one I posted on this blog), is live on Novelkicks today, check it out here. I had this book recommended to me by author Fiona Gibson (look at me name dropping!). We’d been talking about previous novels we liked, and as she loved You Had Me at Hello as much as I did, I thought I could trust her judgement. Then, when Laura decided to have it as Novelkicks’ book club book of the month in February I knew I had to read it. It really was good, really good. Sophie is written so well, she’s a character I couldn’t help liking. James is an idiot, you can’t help disliking him. I find such vastly different views on two of the main characters brilliant, my emotions being mixed during the novel! When I was younger I went through a relationship very similar to James and Sophie’s, so I totally ‘got’ it, and I know Sophie grew as a character because of it, just as I did as a person. Enough of the characters, enough of the story – food! Mmmmm. Sophie is a dessert creator for a supermarket chain, and food lover (and I think Ms Newman must be too). I am too (the lover bit not the creator bit) and some of the pages were so alive with desserts and other foods. They were described so well, and sounded so good, I’m sure I dribbled a few times. I almost feel like put on weight reading it! My only criticism, is one very similar to one I’ve had before, I think the cover blurb gives too much away, I think it would be so much better as a do they/don’t they novel, but I can’t take that away from Newman at all. Heat magazine summed this book up brilliantly, ‘If you are a girl with a passion for food, (which I totally am), this modern city heartbreak is the book for you.’ Read it, you won’t regret it. 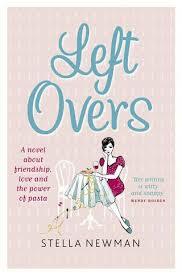 I’m already massively looking forward to her next novel – Leftovers which comes out in the next few weeks.